Attorney James Robert Moye of Posey, Moye & Cartledge, LLC, brings more than 40 years of experience in his practice of estate planning, estate settlement and real estate law. On behalf of his fellow west central Georgia residents, he has facilitated complex probate processes and helped in the purchase, sale and financing of residential and commercial property. The death of a loved one is an emotionally trying time for a family. However, distributing that family member's assets in probate is a necessary step during a difficult transition. Real estate transactions, while usually not as emotionally charged, require an equal level of diligence. Complex laws, regulations and volumes of deed records require an attorney who will attend to every detail and hold his clients' funds in absolute trust. With dedication of all the time necessary to professionally complete the task, Jim Moye navigates his clients through all legal complexities involved in real estate and probate. He prides himself on tailoring practocal, proactive strategies towards resolution based on his clients' needs and goals. As the legal process moves ahead, he maintains flexibility in contingency planning should unexpected issues arise. As a lifelong, multi-generational resident of Columbus, Jim Moye puts his clients first. He is devoted to resolving their complex legal problems efficiently and effectively through personalized legal representation. 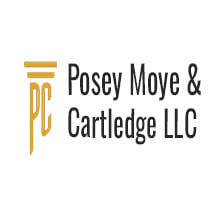 The office hours at Posey, Moye & Cartledge, LLC, are weekdays between 9 a.m. and 5 p.m. At our law firm, we also make ourselves available on weekends and evenings upon request.